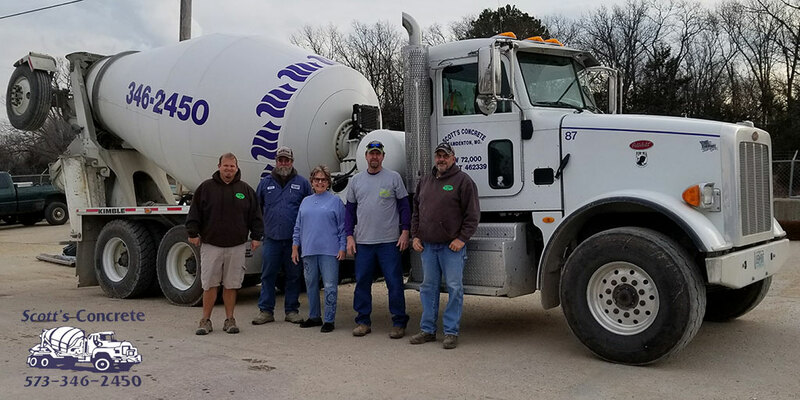 Scott’s Concrete is your local ready-mix concrete supplier for Lake of the Ozarks. We have a large fleet of trucks which enables us to provide ready-mixed concrete to any project location large or small. Scott’s Concrete is the Lake’s trusted source for ready-mixed concrete. Family-owned and operated, our team provides prompt delivery and extremely competitive prices. We can handle jobs of all sizes, from residential driveways and patios to commercial parking lots, parking bumpers, concrete foundations and more. Ready-Mix Concrete supply is one of the most important choices to make when starting a construction project. Big or small Scott’s Concrete can handle your projects ready-mix needs. At Scott’s, we pride ourselves on service not only in delivering a quality mix on time but standing behind our reputation for being the best Ready-Mix Supplier at the lake year after year. From our ACI certified sales staff, dispatchers, and ready-mix delivery staff let us show you why we are #1 at the lake. Call the main office at 573-346-2450 for all your Ready-Mix Needs! CALL TODAY FOR YOUR CONCRETE & READY-MIX NEEDS!